The band fell apart in 1996 and, despite lucrative offers, the quartet had repeatedly refused to entertain a reunion. But they confirmed they had buried their differences and will play a pair of shows in Manchester next year, along with other dates around the world. Frontman Ian Brown said: "I think we're great and I think we've still got it and I think we've got something to give to people. And I think in times like this we can uplift people." Bass player Gary 'Mani' Mounfield said: "There's something magical happens when us four are in a room together. You can't put your finger on it. It's just so beautiful to get hold of it again." The news was met with delight by many fans, including former Oasis star Liam Gallagher. 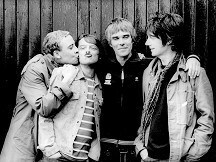 In a message on Twitter, he said: "Stone Roses getting back together - not been this happy since my kids were born." The band - famed for tracks such as Fool's Gold, I Am The Resurrection and I Wanna Be Adored - had a huge rush of success following the release of their first, self-titled album in 1989. But tensions rose within the band during the five years it took to release a follow-up, and in 1995 guitarist John Squire and drummer Alan 'Reni' Wren quit. The band limped on with replacements but eventually folded in 1996 after a poorly received show at Reading Festival. Squire and Brown - who had been childhood friends in the Manchester suburbs - have had barely any contact since, but began to patch things up when they attended the funeral of Mani's mother earlier this year.